Hi There, I wanted to share with you my recent experience of selling an unused domain name for a profit. Around a year ago, I had purchased the domain AppStoreMonitor.com to build a saas product to monitor app store listing of any apps. Back then I had some extra time to work on this product. I started research and even wrote some code but due to other freelance project commitments, I was unable to continue work on this project. And the domain sat unused for about a year. Until a few months ago, I had never even heard the term Domain Flipping, this is buying lucrative domain names and selling them for a profit. I read an article about domain flipping and wanted to try it myself with my unused domain names that included the above-mentioned one. This article I read guided me to list my domains on sites like Sedo, Flippa and other forums that are exclusive for buying and selling domain names. Deciding on a reasonable price for these domains was quite difficult since I was new to this sort of hustle. But after a few trial and errors, I figured how to price them. After this point, it was the waiting game. At last, after a few months of waiting for someone to contact me, I got just the email I wanted. Some random human on the internet emailed me, saying that they were interested in buying AppStoreMonitor.com. After a few email exchanges, we settled on a price and I sent a Paypal invoice. Then the transaction was settled and the transfer was made. All of this in less than a few hours. I now feel that the few months I waited was worth it. As you may know, I am a Freelance Web & Mobile Developer offering software development services. Domain flipping for me is a whole different world of business. I want to explore what more I can do to better the sale of my domains in the future. I don’t see myself living off of selling domains but no one says no to extra income by selling something they don’t use. 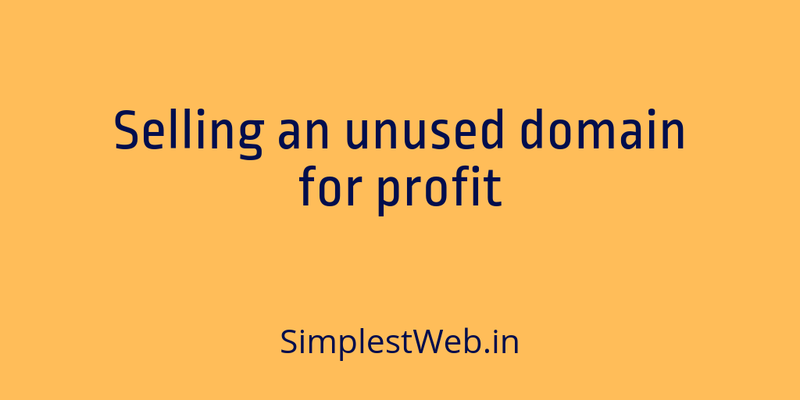 If you have a domain setting unused, try to sell them. If you need any help do let me know, will try to help out. And, that’s all for now.